The challenge for Google will be to get developers on board. For me, the most exciting announcement at Google I/O in May wasn't even mentioned in the opening-day keynote. During the second day of the conference, Google dropped some rather big news: The Play Store and Android apps will come to Chromebooks later this year. As someone who's been a big Chrome OS believer for years now, I was quite pleased at the notion of having more apps and better offline capabilities. It's just what the platform needs to fully move past its "glorified browser" reputation. 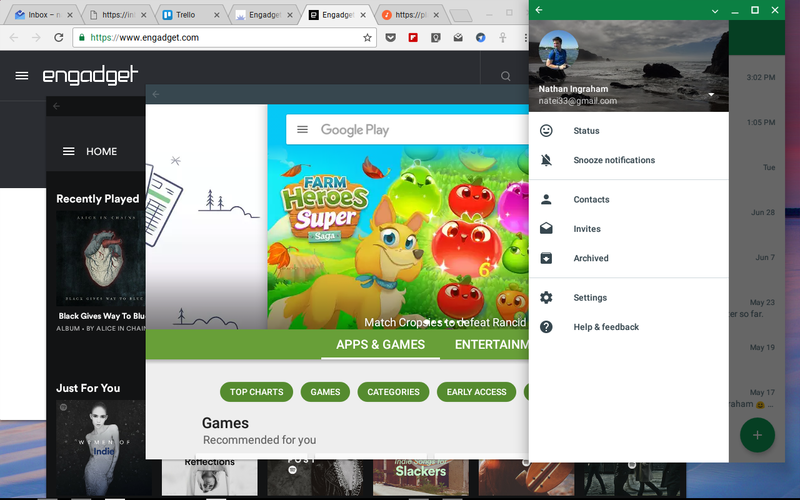 While the Play Store won't officially come to Chromebooks until the fall, there is a way to give it a shot today. 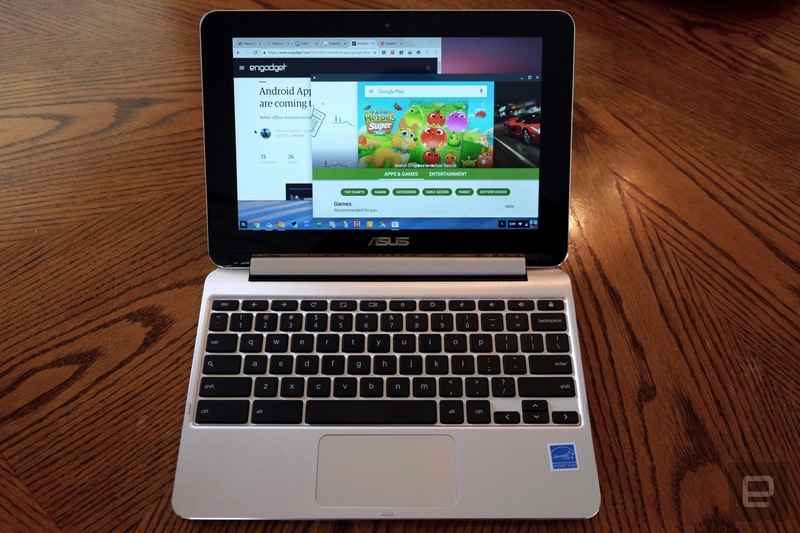 If you install the Chrome developer channel on the ASUS Chromebook Flip, you can try Android apps out now. I've spent the past few weeks seeing how much running Android on a Chromebook changes the experience of using the platform -- for good and for bad. Before diving in, it's important to reiterate that this isn't a final build of the software Google plans to release this fall. As such, I ran into a handful of bugs and general performance issues. I'm not counting these problems as a knock against the feature yet, as these things are likely to be fixed by the time the Play Store reaches consumers. If you've used the Play Store on an Android phone or tablet, you'll feel at home here. The Play Store icon shows up in the Chrome OS shelf and app launcher, and once you're in, you can search for any program you want. Of course, not all of them are currently compatible with the Chromebook Flip, but it seems like most apps that run on Android tablets will work here. Once I downloaded my go-to apps (Slack, Twitter, Trello, Microsoft Word and Excel, Spotify, Google Play Music, Google Docs, Hangouts, Keep, Facebook Messenger) and a smattering of games (Crossy Road, Pac-Man 256, Alto's Adventure, Rayman Adventures, Badland), I set out to see how Android apps change the experience of using a Chromebook. What surprised me the most was the realization that, for much of what I do, Chrome OS web apps are as good if not better than their Android alternatives. 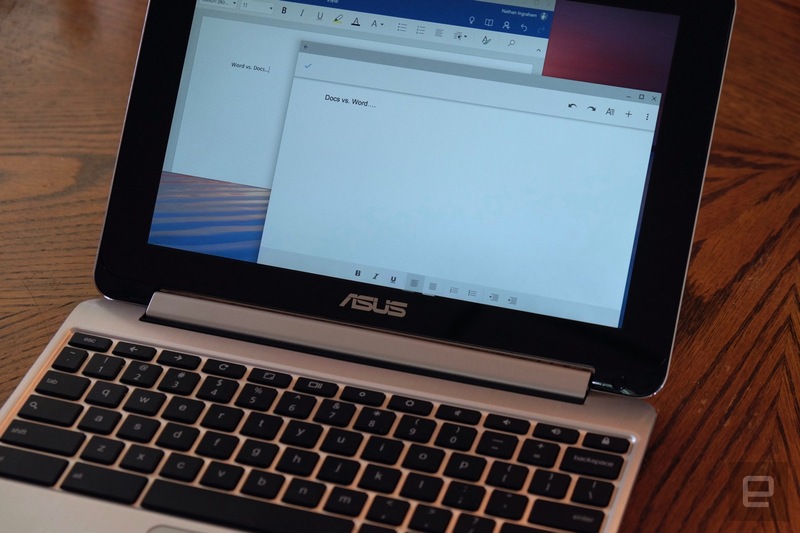 The problem is that most Chrome OS apps are optimized for a traditional laptop, while the Android counterparts are built with a touchscreen interface in mind. That's not to say that the Android apps didn't work; for the most part, they were all perfectly fine. But in Wunderlist, for example, I was unable to click and track tasks in my projects to rearrange the order. In Android, you tap and hold and then drag to reorder items. But that didn't work on the Chromebook (the early developers' edition caveat applies here), so reordering things was out of the question. Google Docs is another example. The Android app has gotten very capable in the last year or so, but the web app still keeps more of the UI right up front, making it easier to dig into menus and execute the layout edits and updates you want. The web app for Slack is another instance where it's much easier to get around. The Android version is designed more for phones than larger-screened devices like tablets and Chromebooks, so you see a lot more info when using the web. And while offline features for Google Play Music are welcome, you could already save Play movies and TV shows offline. 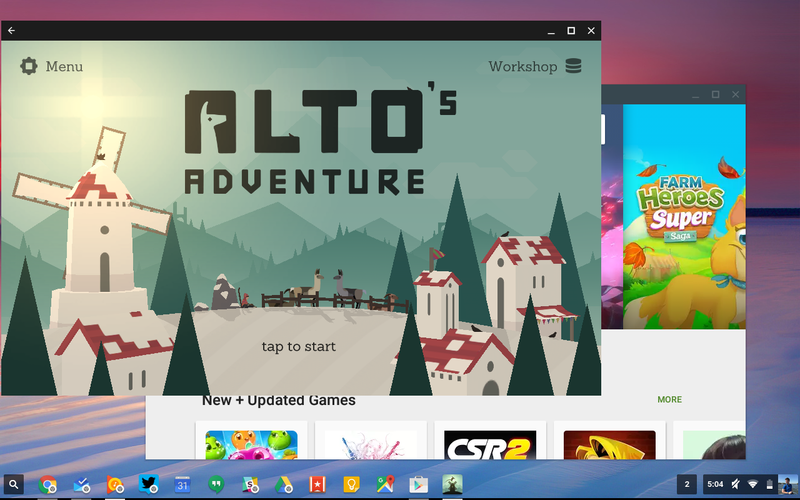 For the record, I'm not disappointed with Google's execution of the Play Store on Chrome OS. I'm hopeful that developers will take the time to make their apps work better on Chrome OS than they do by default; most programmers haven't had a chance to optimize their creations for laptops. Indeed, it's similar to the problem Android has long had with tablets: Most developers build for phones, with tablets being an afterthought. Hopefully, Chromebooks' rapidly growing market share will help Google convince developers that optimizing their apps for Chrome OS machines is worth the effort. All of these caveats aside, there were a lot of things I liked about running Android apps on Chrome OS. Microsoft Word is excellent: You can save documents locally on the Chromebook for editing offline or pull things down easily from the cloud via Dropbox, OneDrive or Google Drive. The UI feels appropriate for a large screen, and the overall experience felt better to me than using Office on the web. I've shied away from Word in recent years because all I really need is a simple text editor that can share documents easily, and Google Docs has fit the bill. But this app is making me take a second look at Word, given how well it now works across platforms. Spotify on Android is another big improvement over the web app. The streaming service has a pretty solid Android tablet app at this point, and the experience is perfectly replicated here. And, of course, you can finally save music offline for when you're away from WiFi. Ditto Google Play Music, if that's more to your liking. The layout is similar to the web app, but being able to save things offline makes a huge difference. 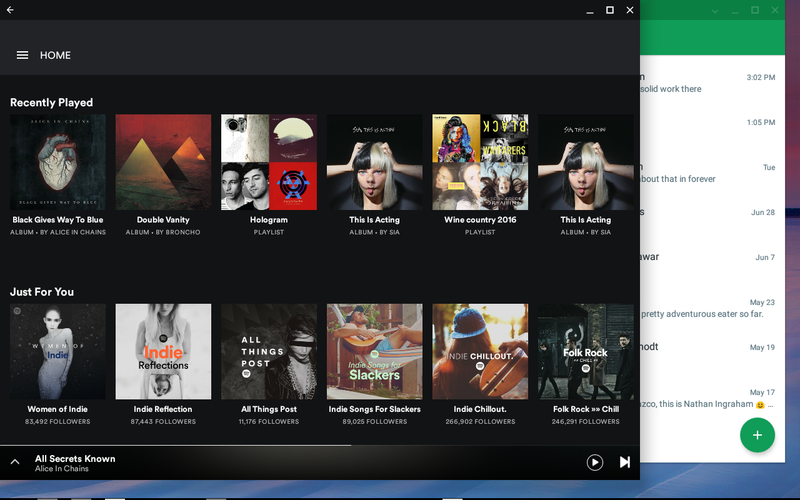 You can also put the app into "phone" layout so it shows up as a smaller, vertically oriented window that's easy for quickly queuing up a playlist. That phone layout comes in handy for messaging apps like Hangouts and Facebook Messenger as well. They're easy to keep in the background while doing work in more-immersive apps and pop to the front when you need them. New messages pop into the Chrome OS notification center just as you'd expect. While notifications integrate cleanly into Chrome OS, unfortunately Android apps make the app launcher a bit more complicated. If, like me, you've installed a bunch of Chrome web apps and then tried out their Android counterparts, you'll end up with a lot of duplicates in your app launcher. It's the kind of thing that Google will work out, but for now it might be a good idea to organize things into folders so you don't get confused. As far as gaming goes, it's nice to have but not something that'll probably drive a ton of interest in Chromebooks. Yes, there are now many more games available on Chrome OS than there were before, but they're all designed with a phone or tablet in mind. That could change, but developers will be building with touchscreens in mind for the foreseeable future. 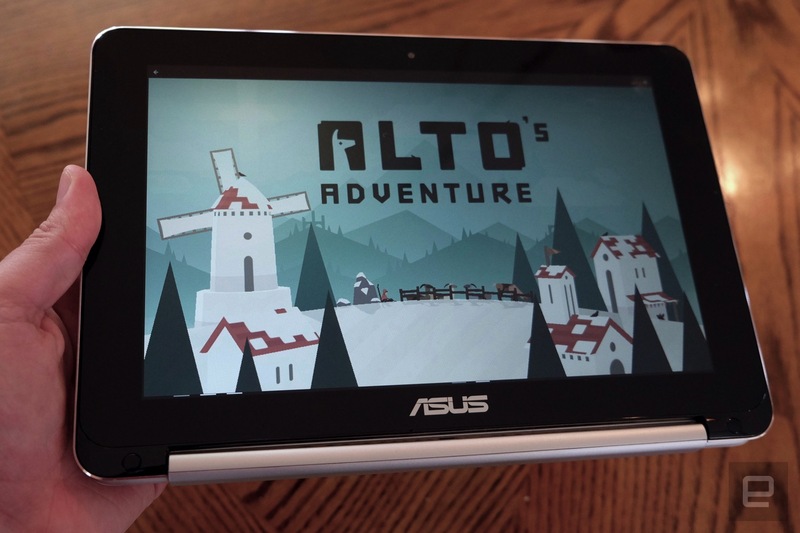 Of course, the Chromebook Flip converts into tablet mode, and in that respect playing games wasn't bad. And some games like Crossy Road and Pac-Man 256 have mapped touchscreen movements to the keys, so I could play them with the keyboard. For the most part, I would have been as happy playing those games on a phone or tablet, but having the option to do so on a Chromebook certainly doesn't hurt. Ultimately, the success of Android on Chrome OS will depend on developers embracing the platform and making their apps better than the current alternative. That's a bit of a long shot, given the trouble Google has had building a vibrant tablet-app ecosystem. But even if that doesn't happen, having the ability to run Android apps as they are today on a Chromebook is a good thing. Many people who might otherwise consider a Chromebook probably have a few things they need to do that the browser doesn't cover. If that's the case, the vast selection of the Play Store will soon be ready to fill in the gaps.